Welcome to the website for ACBL Unit 526 (U526). We are the La Jolla and Beach Unit in District 22 (D22) of the American Contract Bridge League (ACBL). Our games are held at 1 PM on the second and fourth Sundays of each month at the Soledad Club at 5050 Soledad Road in Pacific Beach (See also the Interactive Google Map of major San Diego clubs). We tradeoff the occasional fifth Sunday with San Diego Unit 539. If you play bridge but are unfamiliar with duplicate (tournament) play, check out Karen Walker’s introduction. Completely new to the game? Check out the ACBL’s Learn to Play web page. The Saturday events will be regionally rated, which means all masterpoint awards will be 27% higher than normal for a sectional. Note: the 299er events on Friday and Saturday are only at noon. We did not hold a 299er pairs event last year but attendance patterns from last year’s sectional on the 12 pm and 5 pm schedule indicate we can support a 299er event in the noon time slot. We will hold a 299er event at 5 pm on either day if enough 299er players indicate they will stay for it. The temporarily closure of Adventures in Bridge, pending its relocation, has prompted other clubs to add games. The Soledad Club is adding an ACBL sanctioned game on Wednesdays at 11:30 am starting on April 10th with the exception of April 17th which falls during the San Diego regional. Kathy Moyer will direct. The San Diego Bridge Club has added a Thursday game at 10:30 am, at the same location on Home Ave as their Tuesday morning game. They have also added a Friday 10:30 am game at the Masonic Center. Check their website for details. Adventures in Bridge plans to reopen at the First Baptist Church of Pacific Beach but not until after the San Diego regional. The club had hoped to reopen earlier but this proved not to be possible. The 2018 La Jolla Unit Masterpoint Race Winners are final. Ramey Farah (50-100), Deborah Goldsmith (300-500) and Elaine Chan (2500-3500) convincingly won their Mini-McKenney brackets. Deborah Goldsmith also won her Mini-McKenney bracket at the district level, well ahead of Wayne Gorski from Mission Viejo, and Ramey Farah (200-300) won his bracket in the district level Ace of Clubs. 16 new write-ups, covering September, added November 29th; 26 new write-ups, covering October, added November 30th; 9 new write-up covering November, added December 4th. There are fewer write-up than usual for November because Maritha was teaching bridge on a cruise for part of the month. Maritha Pottenger has a new series of short form bridge writings which she calls “teaching points” based on bridge mistakes she observes around town. If you ask, she will include you on her e-mail list and send them to you a few times per week. The La Jolla unit is also collecting these online, with plans to add new batches every couple of weeks. Maritha writes quickly in bridge shorthand. Thanks to the Maritha Automated Rectification in Translation Helper Accessory (MARITHA) software, the versions posted online are automatically translated to semi-formal bridge writing, complete with suit symbols and other niceties. Maritha has also created many one or two page bridge handouts in the course of teaching bridge in the San Diego area for several years. 42 of them are available online in PDF form. Best 2018 unit game attendance has ended in four way tie amongst Freda Anderson, Elaine Chan, Ben Domurat, and Sue Kane. December eliminated three competitors from what had been a seven way tie at the end of November. The vice president's awards will be given in February. The Italian Blue Team (“Squadra Azzura”) dominated world bridge for over two decades, winning 16 world titles from 1957–1975. They were long dogged by accusations of cheating that were never properly investigated by the World Bridge Federation. Recently, Avon Wilsmore meticulously combed through the tournament records and presents a strong case that the team cheated in his forthcoming book Under the Table (The Case Against The Blue Team). Avon presents many details in his lengthy Bridge Winners article The Talk That Never Was: The Blue Team Rule. As a both bridge player and a student of statistics I find the evidence damning even from the article alone and expect that the book will drive the nail in the coffin. Kudos to Avon Wilsmore for his heroic effort. April 14th winners: Judy and Norton Rimer (Flt A), Charles and Marjorie O’Malley (Flt B + C). March 31st winners: Donald Davidson and John Howard (Flt A + B + C), Kitty and Steve Cooper (2nd Flt A). March 24th winners: Kitty and Steve Cooper (Flt A), Jacob and Tony Tan (Flt B + C). Looking for Soledad Club results instead? *Corrected April 1, 2019 at 9:30 am. The score of 850 to E-W for 5♠* making on the nose on board 3 for Farber-Blaufarb vs. Anderson-Dunham had not been entered into ACBLscore. This correction has only a minor impact on the rankings, dropping Farber-Blaufarb slightly. Further corrected April 3, 2019 at 8 pm. Some early boards for the web movement got passed incorrectly from the highest table which has to manage a First In Last Out (FILO) stack of boards. We didn't catch this for a couple of rounds due to problems with the electronic scoring. In the latest revision, the movement has been edited using the advanced EDM (“Edit Movement”) functionality of ACBLscore to reflect the actual movement, cleaning up an incorrect kludge that relied on split scores. What is the worth of AKQxxx? — a geeky tale of probability and simulation. More hands: The Anti-Finesse Force, Tricky Trump Defense, Criss-Cross Ruffing Clash Squeeze, Trim Squeeze, Risky Loser Discard, Stiff Honor Lead, and Safe Hand Endplay, The Bridge Goddess Thumbs Her Nose, “Down Ten” John, Necessary Shape, The Self-Forced Declarer, Shifting Forces, The Two-Six Dream, The Submarine Ruff, Suicide King, Curiously Wrong-sided, Triumph of the Intermediates, and Lady Lavender. Hand Index. Days of Thunder, a review and discussion of Eric Rodwell’s The Rodwell Files: Secrets of a Bridge Champion and a close look at one of the many fascinating hands presented therein. ACBLmerge 1.3.5 was released on November 19, 2014. It adds full support for Mac OS X. ACBLmerge 1.3.4 was released on November 7, 2014. This is primarily a bug fix release, including the fix of several bugs in the par calculation. Double dummy calculation is now faster and clicking on a board number in the recap sheet navigates to that hand in the main report. Read more. Since December 2011, Philippe Lamoise, a bridge player in the North County unit, has been developing the Bridge Results website and I have been making many improvements to ACBLmerge to integrate with the functionality provided by his website. Now it is easy for club directors, club managers, and tournament officials to upload game results using a web interface without knowing anything about running ACBLmerge. Read more about Bridge Results. Programmers may be interested in the more recent ACBLgamedump utility for directly reading ACBLscore game files, based on the ACBLscore game file format documentation (reverse engineered). This utility is tied to the future of ACBLmerge and has been used by Bridge Results in recent times to generate de novo reports. Maritha Pottenger’s “Teaching Points” short form write ups. Using BridgeTab on Amazon Fire Tablets. The Mini-McKenney counts total masterpoints earned for the year and the Ace of Clubs counts only masterpoints earned at clubs as opposed to sectionals, regionals, and nationals. There are multiple brackets for each race based on the number of masterpoints a player has at the start of the year. Find news that has migrated off the homepage on the Table Talk page or the Youth Teaching and Masterpoint Notes blogs. Unit News published in the Contract Bridge Forum is also available on our website. The Education & Resources page contains many links to rules and regulations, San Diego players, bidding and card play, online play, and even a bit of humor. The Free Bridge Software page has descriptions and links to some great free programs. The Analysis Projects page links to some in-depth analyses of bridge data, including the The Payoff Matrix. 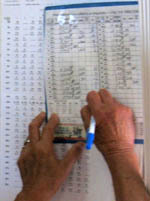 The Conventional Wisdom series ( , 1.6 MB) from the ACBL Bulletin explains how to fill out a Convention Card accurately. Unlike the version on the ACBL website, our version has the entire series in a single document, complete with an index. If you encounter a Zero Tolerance incident at our unit game or any of the clubs within our unit, please fill out our U526 Zero Tolerance form and return it to Bill Grant, our unit recorder. Various articles: How to be a Fast Player, Essential Bridge Books, Notes from Kantar’s Modern Bridge Defense books, Esplanade Club Closes. Tolstoy Understood Bridge Players. He is baaaack! Or at least his website is. The webhosting contract for Marvin’s original website lapsed in 2015, a few months after his death. Shortly after Evan Bailey passed away I told Marvin that I had vacuumed up a copy of Evan’s website so that I could re-host it after the webhosting contract lapsed. Marvin was happy to hear that and hoped I would do the same for him after he “kicked the bucket.” So here you go, Marvin! 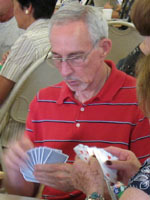 Marvin French’s many contributions to bridge literature include Squeeze Refresher, his Bidding Handbook (Four-Card Majors: Western Natural Updated), Defense Handbook, AmBIGuous Diamond Bidding System, Skeleton Bidding System, Party Bridge Guide, Beating the Experts, Fairness in Duplicate Pairs Games. Five vs. Four, and other bridge articles. He also wrote about blackjack, literature, and reasoned skepticism.